This article highlights the properties of an attractive drug target, outlines the approaches used to identify targets, and discusses the key steps involved in target validation and the benefits and challenges of using siRNA to validate targets. "A good drug target needs to be relevant to the disease phenotype and should be amenable to therapeutic modulation. At the same time, you need to have a good therapeutic window to assure that any therapeutic modality aimed at the target will not cause side effects by disrupting the physiological function of the target in healthy tissue." Dr. Kilian V. M. Huber, Structural Genomics Consortium & Target Discovery Institute, University of Oxford. But what makes a ‘good’ target? The target has a confirmed role in the pathophysiology of a disease and/or is disease-modifying. Target expression is not evenly distributed throughout the body. The target’s 3D-structure is available to assess druggability. The target is easily ‘assayable’ enabling high-throughput screening. The target possesses a promising toxicity profile, potential adverse effects can be predicted using phenotypic data. Besides the literature, there are numerous other target identification strategies, which can be based on one of two target identification strategies (Figure 2). The first is target deconvolution – in this scenario you begin with a drug that appears efficacious and the target is identified retrospectively. 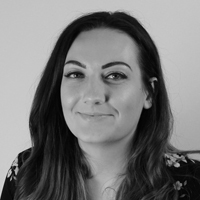 The other is known as target discovery – this approach works on the concept that ‘if you want a new drug you must find a new target’, once a target is identified compound libraries are then screened to find a drug that binds to the target and elicits the desired effect. Figure 2: An overview of target deconvolution vs target discovery. "In principle, there is no regulatory requirement to know the molecular target of a drug or clinical candidate since all that matters in the end is that a drug is safe and efficacious. In fact, there are a number of approved drugs for which the mechanism-of-action is unknown. However, the drug development process is obviously greatly facilitated if the target is known since this enables rational design of new molecules with improved potency and safety profiles." Dr. Kilian V. M. Huber, Structural Genomics Consortium & Target Discovery Institute, University of Oxford. The phenotypic approach to drug discovery falls within the realm of target deconvolution, and involves exposing cells, isolated tissues, or animal models, to small molecules to determine whether a specific candidate molecule exerts the desired effect – which is observed by a change in phenotype.3 Whilst numerous animal models can be used for the characterization of small molecules and small-scale drug screening approaches, use of mammalian cells is often favored due to their compatibility with high-throughput screening (HTS) and greater physiological relevance. The phenotypic approach goes beyond individual proteins or nucleic acids and involves the study of entire signaling pathways. The drug’s effect is determined before the specific biological (drug) target that underlies the observed phenotypic response is identified. The greatest advantage phenotypic approaches have over target-based is their ability to demonstrate the efficacy of a drug in the context of a cellular environment. The drug is acting on the target in its ‘normal’ biological context, rather than on a purified target in a biochemical screen. Cost, availability of cells, complex assay methodology, and throughput are all potential challenges associated with cell-based phenotypic screens. However, as assays become miniaturized and the use of three-dimensional cell models (organoids and spheroids) continue to gain momentum, both scalability and physiological relevance have been improved, leading to greater adoption of phenotypic approaches. In addition, this resurgence in phenotypic screening has encouraged further major technological advances, including the development of iPS cell technologies, gene-editing tools, and detection and imaging assays,5 which have again positively impacted this approach. 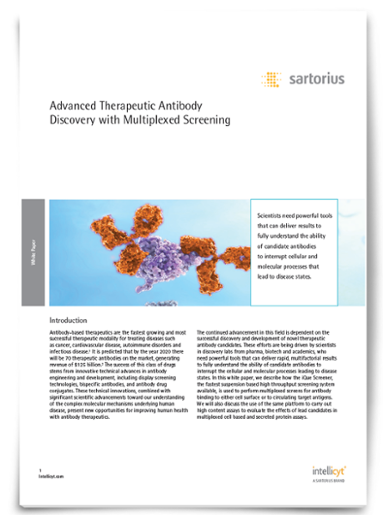 Antibody-based therapeutics are the fastest growing and most successful therapeutic modality for treating numerous diseases including cancer, autoimmune disorders and infectious disease. Download this whitepaper to learn more. Table 1: An overview of target deconvolution, discovery and validation techniques. 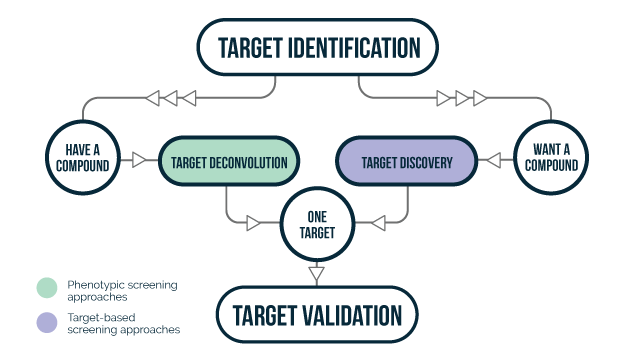 Target validation can be broken down in to two key steps. Reproducibility. Once a drug target is identified, whether it be via a specific technique (Table 1) or from review of literature, the first step is to repeat the experiment to confirm that it can be successfully reproduced. Introduce variation to the ligand (drug)-target-environment. - It should be possible to modulate the drug’s affinity to the target by modulating the activity of the drug molecule. - Varying the cell or tissue type, should or should not, alter the drug’s effect. 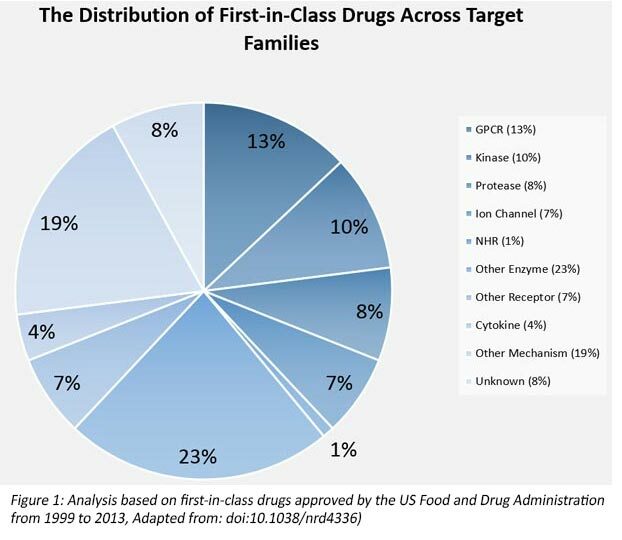 "The only real validation is if a drug turns out to be safe and efficacious in a patient, a major challenge is that many targets fail late in the clinic, several years after initiation of the project. Thus, we have to improve on our ability to identify promising targets early on and open science and sharing of data may help in this regard." Dr. Kilian V. M. Huber, Structural Genomics Consortium & Target Discovery Institute, University of Oxford. Several different target-validation techniques can be used to elucidate target function,7 however, by far the most popular and most widely used approach utilizes small interfering RNAs (siRNAs).7,9 siRNA allows you to mimic the effect of the drug via mRNA modulation resulting in the temporary suppression of a gene-product – your drug target.8 It is therefore possible to demonstrate the ‘value’ of the target without actually using/having the drug. By observing the phenotypic effect that results from a decrease in the target protein you can confirm whether the target warrants further development. As both phenotypic and target-based drug discovery approaches each have distinct benefits and challenges, perhaps rather than being viewed as opposing drug discovery strategies, they should be seen as complimentary, which, if used together could increase the likelihood of discovering a truly novel therapeutic strategy. 8. Wermuth, C., Aldous, D., Raboisson, P., & Rognan, D. (2015). The Practice of Medicinal Chemistry (4th ed., pp. 45-70).